Happy Birthday, Dad! There are very few things my Dad loves in life and furniture shopping is one of them. So for his birthday and my parents' anniversary, we hopped on a plane and flew to Bali! We managed to squeeze a few sites in between furniture shopping (they bought a door, guys). I'll be sharing a few tips and a lot of photos, so click for more! 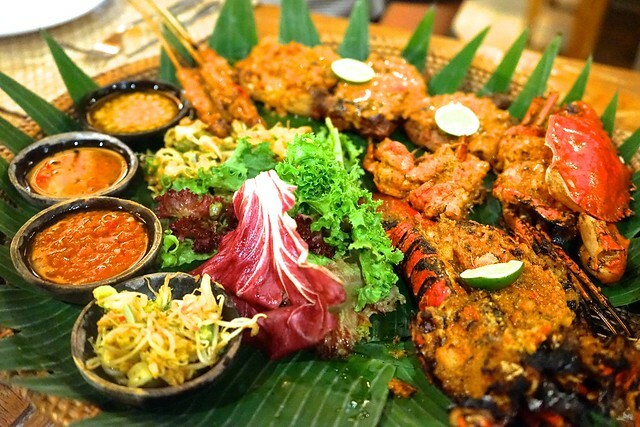 EAT Filipinos are no stranger to the flavours that Balinese/Indonesian cuisine has to offer. Almost every restaurant we walked into offered Nasi Goreng (Indonesian Fried Rice), Pad Thai, Tom Yum Goong and various kinds of Satay sticks. 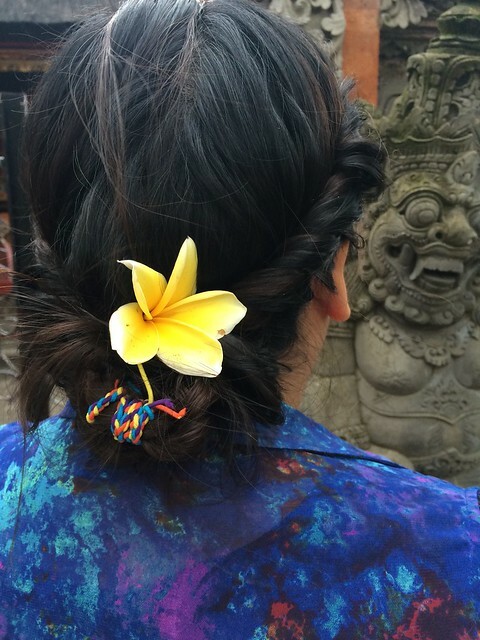 So when in Bali, do as the Balinese do and try them all! The prices in these restaurants are relatively low for such touristy areas (around P300 per plate), so it's fun to order a lot of things and experiment. 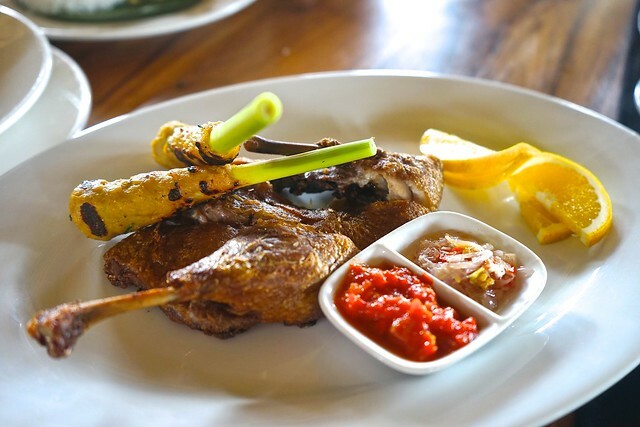 While Balinese call their Babi Guling (roast pig) their most authentic dish, we found ourselves munching on moist, fried duck or Bebek. Most of the Bebek restaurants in Bali have a gorgeous view of rice fields as you eat, and with the cool December rain, it was a perfect meal! I fell for the fish satay in lemongrass skewers right away. SEE No offense to Bali, but their beaches have NOTHING on the beaches here in the Philippines. What struck the tourists in us were the ubiquitous temples surrounding the island. 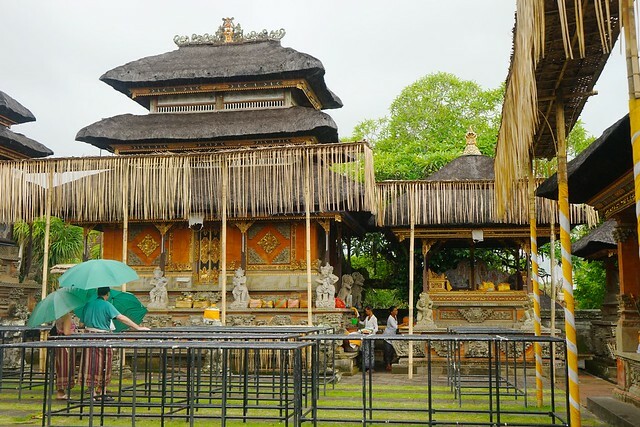 As our new friend Eka said, "it's easier to count the number of people in Bali than the temples!" 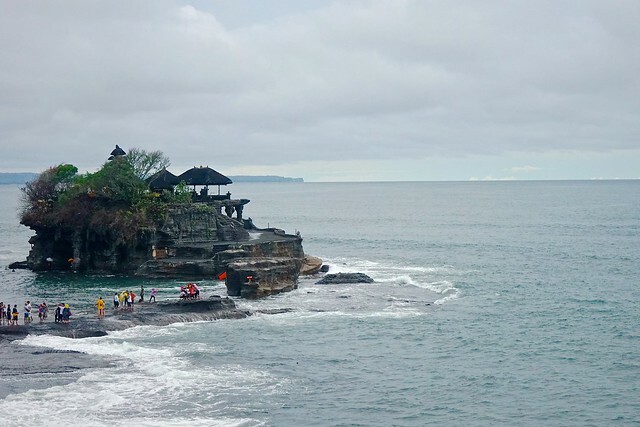 Tanah Lot Temple from a distance was packed with people, but quite nice to see. The scenery of the open sea was fantastic, and we were lucky enough to catch a little bit of the sunset, despite the rain. 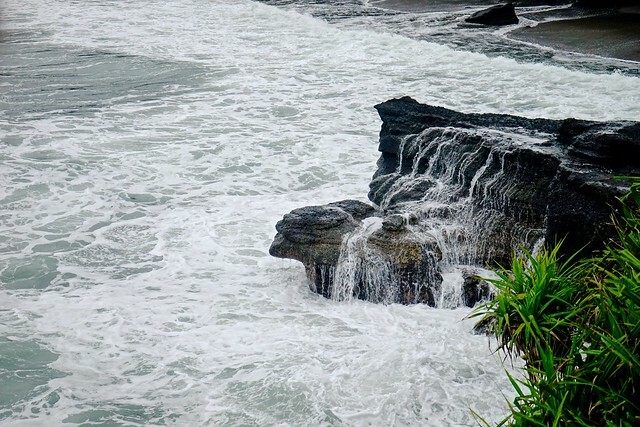 A little bit scary, though when tourists would step out of the bounds over the cliffside just to take a photo. Taman Ayun Temple felt like a royal palace. There were pristine, sprawling fields, bright purple flowers and gorgeous carved stones everywhere. While we couldn't go into the 14th century temples in the back, it was a great place to snap photos. We also caught a show while we were there. 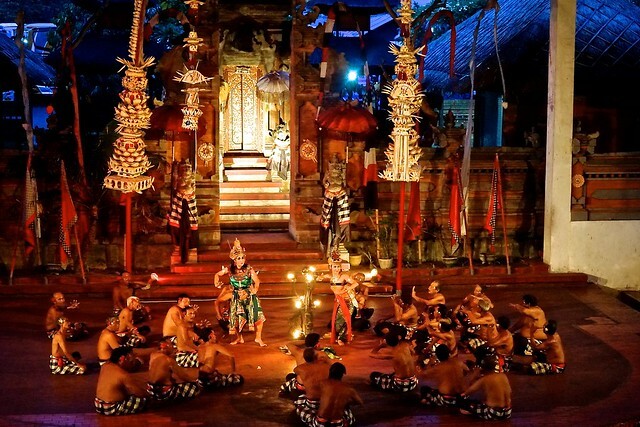 The music was only the continuous chanting of 50 men, and told the story of Rama and Sita, legendary characters that are known in the Philippines as well. Later in the show, they featured a man in a trance who plowed through burning hay. Furniture shopping is my parents' new hobby. So it was inevitable that we ended up in Ubud to visit the craftsmen. 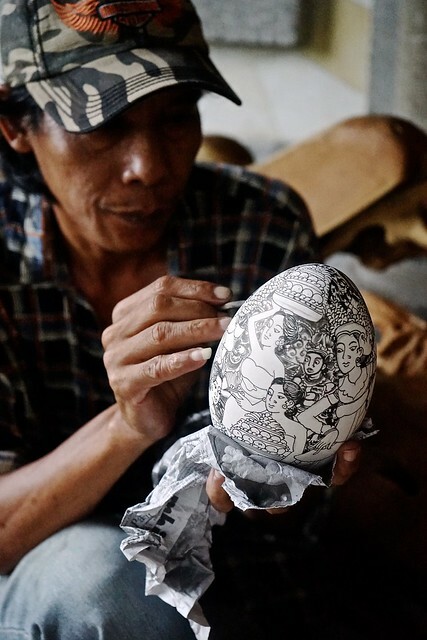 Bali's biggest industry is still crafts, and Eka told us that it's common for the family to have artists, it's actually a job of great pride. I have to agree with them on that. 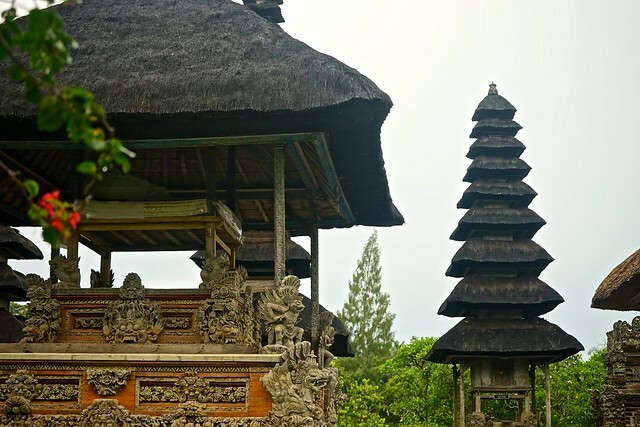 All the art we have seen in Bali is so delicate and intricately made--definitely unique. 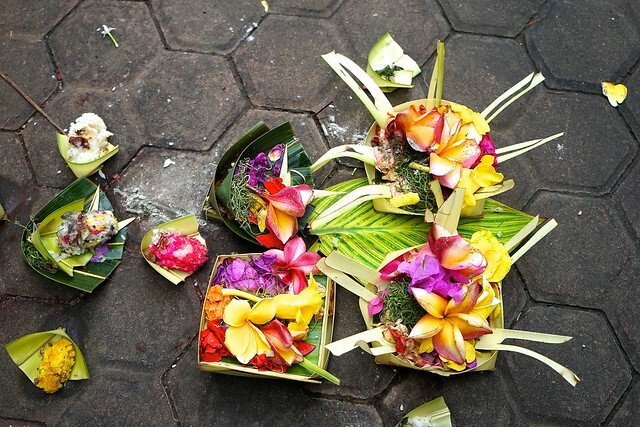 The Balinese practice their own blend of Hinduism. They eat pork and have offerings for their gods every day. It's not a strange occurrence to find canang sari on every possible corner of the island (even our car windshield had one). 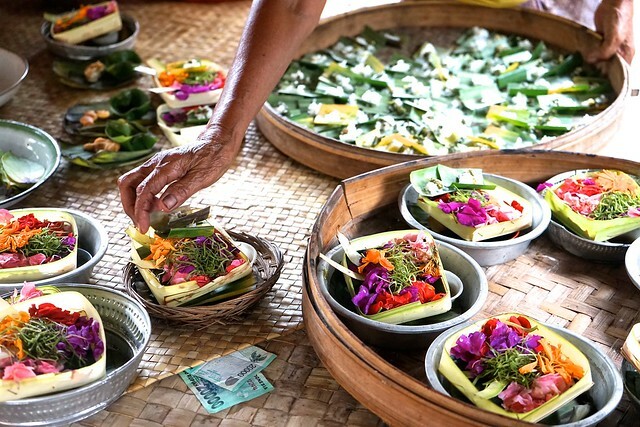 These daily offerings have four colours and sometimes come with small snacks like candy or portions of rice. As far as the things we did...we basically just lived like royalty. Sudamala Suites and Villas in Sanur is on my top ten places stayed ever! Since it was off-season, we got the 2 bedroom Legong villa at a good price, and it was oh so worth it. 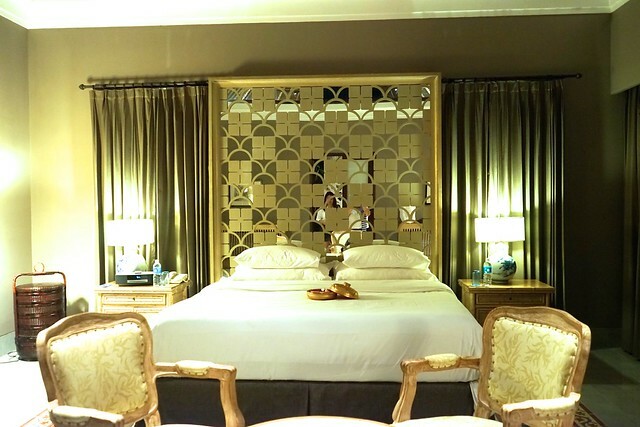 The room had a lovely, pleasant scent, and the floor plan was so open. Plus we had a balcony that had a Balinese door that opened up to the swimming pool---aaaaahhh! I could have stayed there forever. Go off-season: So what if it rains a little? The savings you have on the hotel alone make it oh so worth it.